Randy Clark is proud to return home to beautiful Southern Utah. 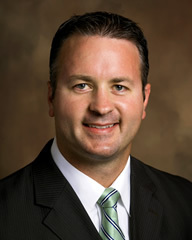 He is a product of Dixie High School, Southern Utah University and the University of Utah School of Medicine. Ever since he was a Dixie Flyer football player inspired by his mentor Dr. Michael Anderson, he has worked toward his dream of becoming an orthopedic surgeon. His training has taken him from the football fields of Dixie High School and SUU where he was an all-region and all-American football player to study medicine and nurture his career as an orthopedic surgeon. During his college years, he also spent two years as a missionary for the LDS church in Peru. While at Southern Utah University, he fell in love with the most beautiful cheerleader on the squad and finally convinced Amy to be his wife. During their time in medical school, Randy was involved in Operation Smile, a community volunteer Spanish medical interpreter and performed orthopedic biomechanical research. Due to his exposure to wonderful mentors and his motivation to excel, Randy was accepted to a top orthopedic surgery residency program at the University of Iowa, where he was fortunate to train under some of the legends of Orthopedics. During his five-year tenure as an orthopedic resident he was blessed with the opportunity to care for University of Iowa Hawkeye athletes. This experience and wonderful mentors inspired him to become a sub-specialist in sports medicine. One of the greatest opportunities of Randy’s career was to complete an additional year of training in the form of a sports medicine fellowship at the world renowned Southern California Orthopedic Institute (SCOI) with pioneers in minimally invasive shoulder, hip, knee, foot and ankle surgery. Randy had the opportunity to help care for collegiate and professional athletes, movie stars and wonderful people from all over the world. During his fellowship at SCOI he published and presented his orthopedic research, authored textbook chapters and has produced several educational surgical videos. This fifteen-year journey away from St. George has been a wonderful experience and brought three beautiful children by the name of Cooper, Caroline and Calvin. Randy and Amy feel fortunate to return to Southern Utah with their young family. Randy especially appreciates the opportunity to bring sports medicine expertise to Southern Utah and hopes that you will provide him with the privilege of caring for you!